The above info came from Cleopatra, and was edited by yours truly (contact me). The image came from AnimeLab.com. Ichigo Momomiya is your normal 13 year old girl, but when she goes on a "date" with her crush Aoyama, something strange happens. 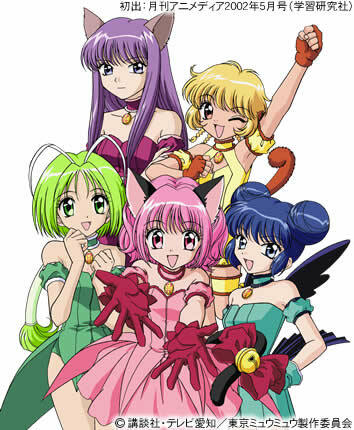 Ichigo is accidentally fused with the DNA of a wildcat, becoming the first memeber of the "Mew Project". Equipped with her new powers, Ichigo must now become a crime fighter, protecting the world from an invasion of evil aliens called Kirema Animas. She must find her team members and keep her new identity secret while also working part-time in the secret cafe base! The above description came from Cleopatra and n/t, and was edited by yours truly (contact me).